As a parent, one very important decision is selecting the best educational establishment for your child. We are dedicated to making each child's academic experience supportive, enriching and fulfulling. 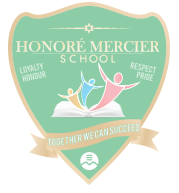 At Honoré Mercier, your child will love to learn!